All transactions are safe and secure with a reliable history in online purchasing behind each of our associates. 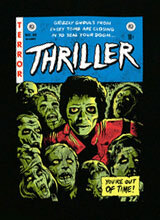 Buy the Thriller Michael Jackson t-shirt to own Michael Jackson clothing and merchandise. If you are looking for a shirt that speaks for itself, you have come to the right place. This Michael Jackson t-shirt features the "King of Pop" dancing in his red Thriller jacket. Match it with your glitter glove, black fedora hat and armband. Michael's moves have influenced countless artists ever since he stepped foot on stage as a child with his brothers, Jermaine, Jackie, Tito, and Marlon in the Jackson 5. These MJ tees feature him plain and simple, in black and purple. In addition to the Thriller Michael Jackson tee above, browse the Michael Jackson Clothing Gallery for more apparel like men's and women's clothes, kids shirts or hoodies.